Journals exploring the province of Skyrim. The sun was slowly disappearing in the west, and the road was becoming darker with each passing minute. Unsure of where he was going, Avingard stopped and glanced around for a place to spend the night. All he saw around him were trees and rocks. Reaching into his pocket he pulled out a map of Skyrim, which was given to him by his father, a proud Nord that once called Skyrim home. Avingard is not a true Nord as his mother was a Breton, and while he has the size and strength of a Nord, many of his features are true Breton. His father was Roggard Heart-Tooth, an accomplished blacksmith before he left Skyrim 31 years ago. 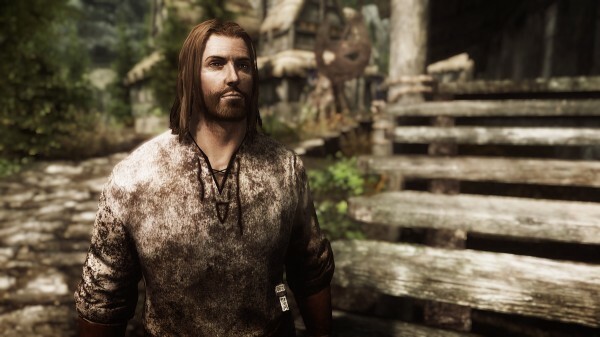 He had met his love, a Breton named Fasette Jenseric, while working as a blacksmith in Skyrim. After they married in Skyrim in 4E169, they would move to High Rock the following year. It was during the first few years while Roggard and Fasette lived in High Rock that the Great War would begin. The armies from the Aldmeri Dominion invaded the Imperial provinces of Hammerfell and Cyrodiil. Roggard felt a desire to help out the Empire, but his home life was just too important to put in jeopardy. In 4E173 Fasette gave birth to their only child, a son. They named him Avingard. Roggard now realized that, while his desire to join the Empire was great, his wife and new son were more important, and he would be in a better position to protect them if he stayed. With the signing of the White-Gold Concordat treaty in 4E175, Roggard thought that peace will once again rein, even if he didn’t agree with the treaty. Unfortunately, the province of Hammerfell would leave the Empire after rejecting the treaty, and the war between Hammerfell and the Aldmeri Dominion would continue. Fasette realizing that she could no longer keep her husband at bay, instructed him to go to Hammerfell and join the war. In 4E175, Roggard would leave his family behind and travel to Hammerfell where he would use his blacksmith skill to provide weapons and armor to the Redguards. One year later, Fasette would pack up what she could carry, and along with Avingard, and traveled to Hammerfell to be with her husband. With the war continuing between the Aldmeri Dominion and the Redguards of Hammerfell, and medicines getting scarce, Fasette would contract Cholera and die. It would be 2 more years before the war would end in a stalemate with the signing of the Second Treaty of Stros M’Kai, and Roggard could once again live in peace and raise his only child. By 4E201, Roggard’s health began to deteriorate. His strength had left him, and he became bed ridden for much of his days. He would pass away soon after with Avingard by his side. Before dying, he would instruct his son to travel to Skyrim and take up arms against the Stormcloaks who had murdered Torygg, the High King of Skyrim. Avingard would promise his dying father that he will fight for the Empire. Avingard would travel to Elinhir in Hammerfell and would then cross the border into Skyrim. Now as he looked at his map he realizes how dangerous his promise to his father would probably become. If interested, I have created a page that lists all the skyrim mods that I use when I play the game to create my journals. If you would like to view all the screenshots that I take for all my journals and blog posts, you can view them at Skyrim screenshots.